Here's one of the local squirrels checking things out and doing what squirrels do. This week you're going to have to put your own story and title as my brain doesn't want to function. 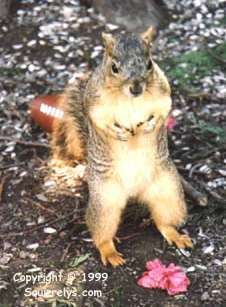 Here's one of the local squirrels getting ready for this years football season. He said that his tail keeps getting in the way when he hikes it but that's one of the hazards of squirrel football. Notice the almost perfect blocking posture. Now if I can just get him to stop wearing flowers on to the field, I think the guys would stop laughing at him. Here's Tiger the Squirrel Woods trying to make up his mind on either eating the nut or whacking the golf ball. After looking around and seeing the cat it was an easy decision. 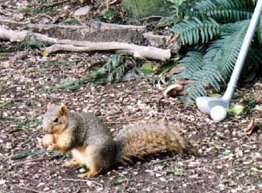 The cat is walking around with a funny look on her face again and Tiger's munching on his nut. Here's Snoopy coming out of beauty salon wearing the latest fashion in squirrel hairdo. 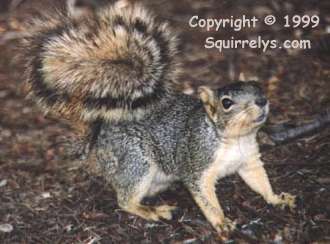 It's called a squirrel puff and seems to be catching on great here in the Northwest. This is her second visit in less than a month. I think she's been talking too much with my wife. She says if I want her to be an Internet squirrel I'm just going to have to pay the price. I suppose next she'll want to do her finger nails.